This is not new technology but still has its place in assembling PCBAs. At Speedboard we have a Lead Free Blundell CMS400 wave soldering machine fitted with Argon gas to help reduce dross and improve barrel fill. Wave soldering is mostly used for Through Hole only boards or Single Sided SMD boards where there are a significant number of through parts fitted top side. Wave soldering is still preferable over hand soldering as it is a controlled process with pre-heating, automatic fluxing and of course wave soldering of all the joints. Giving a more repeatable and better quality solder joint. It is possible to use custom pallets to achieve selective soldering via the wave. However, with Speedboard having an Ersa Selective Soldering machine we would now use this dedicated machine rather than pallets on the wave soldering machine. For Leaded work we also use the Selective Soldering Machine as we hold a separate pot for this. 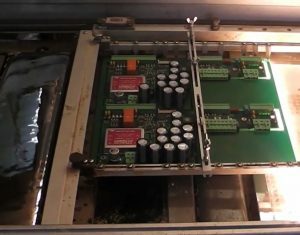 Although this may be slightly inefficient when it comes to processing the boards, the change over time of the machine is much quicker. Having all types of process is key to what we offer at Speedboard. Be it SMD Reflow ovens, Vapour Phase reflow, PDR hand place, Hand Soldering, Selective Soldering or Wave Soldering. Having the right process for the right job is what makes us standout from the crowd. If you would like to know more about wave soldering or any other services which will benefit your manufacturing needs please do not hesitate to contact us.